A selection of superior electrometers is available for accurate measurements of an extremely wide range of brachytherapy sources, external beam and diagnostic x-ray applications. A next generation, two channel, reference grade electrometer with an advanced, intuitive touchscreen interface, built-in chamber library for real-time dose and dose rate display, and 1 fA resolution. The SuperMAX Electrometer features two measurement channels with independent control over range, bias voltage, and applied system factor. Both channels feature extensive range (0.001 pA to 500.0 nA, 0.001 pC to 999.9 μC) for use in a wide range of applications such as cross calibration between two chambers, isocenter versus off-axis and in-air versus in-water comparisons. The SuperMAX is designed to maximize flexibility encouraging the freedom to experiment with its measurement capabilities. A versatile chamber library is built into the SuperMAX interface, so no additional PC or software is necessary to apply system factor and temperature/pressure corrections. These factor applied measurements are even displayed in real-time side by side with raw measurement values for increased analysis capability. Over 100 different chambers and calibrations can be stored within the SuperMAX internal memory.Individual factors can be applied to either or both measurement channels. Measurement data can be exported to .csv format as easily as saving a word processing document. The included USB flash drive can be used to transfer measurement data to a PC for further analysis. Please click here for a comparison of the specifications of the available electrometers. is a superior instrument for accurate measurement of an extremely wide range of all brachytherapy sources, low dose rate, high dose rate, and cardiovascular. It is versatile enough to be used for all external beam and diagnostic x-ray applications. MAX COMM software is now shipping with every MAX-4000 or MAX-4001 Electrometer! The amp, coulomb, and collection time can be displayed simultaneously, minimizing the need to switch screens. A digital filter built into the MAX 4000 eliminates the effect of noise. This results in a very stable and exact measurement. The user interface is intuitive, simple and straightforward to use so you can do your work quickly. A few buttons control all operations. User activated automatic zeroing: press a button and you are ready to measure! Large, easy to read LCD display: visible from a distance and in low light. Exceptional sensitivity and a wide dynamic range makes MAX 4000 the electrometer of choice for all brachytherapy measurements. It provides immediate measurements of even the lowest activity isotopes. For example, a 0.27mCi iodine seed, measured in the HDR 1000 Plus Well Chamber, gives a signal of 1.458pA. It can also measure 10Ci and higher iridium sources. The MAX 4000 works exceptionally well with all ion chambers typically used for data acquisition in water phantoms, and with all chambers used for quality assurance tests e.g. IMRT. The versatile MAX 4000 is ideally suited for all mammographic, conventional radiology, and CT scanning applications. The accumulated charge and the current readings are displayed simultaneously. 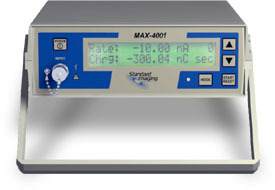 The MAX 4001 Electrometer is a superior instrument for accurate measurement of an extremely wide range of all brachytherapy sources, low dose rate, high dose rate, and cardiovascular. It is versatile enough to be used for all external beam and diagnostic x-ray applications. A digital filter built into the MAX 4001 eliminates the effect of noise. Exceptional sensitivity and a wide dynamic range makes MAX 4001 the electrometer of choice for all brachytherapy measurements. It provides immediate measurements of even the lowest activity isotopes. For example, a 0.27mCi iodine seed, measured in the HDR 1000 Plus Well Chamber, gives a signal of 1.458pA. It can also measure 10Ci and higher iridium sources. The MAX 4001 works exceptionally well with all ion chambers typically used for data acquisition in water phantoms, and with all chambers used for quality assurance tests. The versatile MAX 4001 is ideally suited for all mammographic, conventional radiology, and CT scanning applications. Combined: The accumulated charge and the current readings are displayed simultaneously. The Max 4000 outputs the exact same information that you can see on the display in real time... in other words what you see on the display will be output to the RS-232 port. This information is output in plain old ASCII text so you can use any terminal program to capture the data. If you are running a PC with Win 9X there is a program called HYPER-TERMINAL that will do this for you. You can find it here : START>PROGRAMS>ACCESSORIES>COMMUNICATIONS>HYPER-TERMINAL. With HYPER-TERMINAL the text can be captured as a .txt file, saved, then opened with EXCEL. You can format the data to your requirements from there. The Max-4000 now has firmware available (on new models and as an upgrade) that will allow you to not only capture data but to also remotely control the unit from your PC. The Max 4000 has a "command set" that is fairly simple and easy to use. These commands provide for controlling the Max 4000 from a remote PC as if you were actually pressing the buttons on the front panel interface. There are commands that emulate each of the front panel buttons, plus commands that will provide status information. If you can write scripts using programming languages, such as VISUAL BASIC, this command set can be used to customize your data collection ability. This interface can even be controlled with the same HYPER-TERMINAL program with minor limitations. to the MAX-4000 or MAX-4001 Electrometer by enabling the user to specify and save multiple hardware configurations when taking measurements and working with those results. Operating with this program requires a MAX-4000 with firmware version 4.4 or higher or MAX-4001 with firmware version 1.0 or higher. Take advantage of the communication components in both library and measurement modes, and upgrade your MAX today! 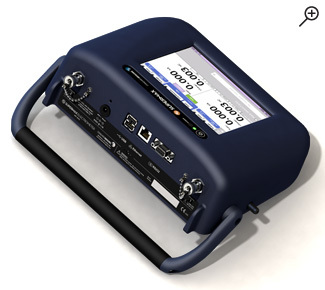 To ensure your electrometer is compatible with the MAX COMM software, please contact SeeDOS for more information on how to upgrade the firmware in your system to the latest version. MAX-4000 with firmware version 4.4 or higher, or MAX-4001 with firmware version 1.0 or higher.